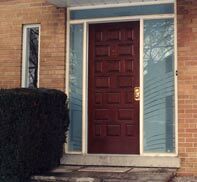 Glass etching on an entrance to a home or office creates a dramatic first impression like no other architectural material can. Etched glass entrys and etched glass doors are elegant and quite sophisticated, modern yet can be very classic. Even the best etched glass design is only as good as the technique used and its execution. Glass Dimensions can deliver on both quality and timeliness which is why leading architects and contractors rely on Glass Dimensions to make their glass etching vision a reality. It does not matter if the frosted glass design or frosted film pattern is in an office, restaurant, laboratory or an airplane, Glass Dimensions has the capability of performing this work on the job site, without the mess and dust of conventional systems, enabling any glass to be sandblasted anywhere that it may be located. Common to residential homes, there is a need for privacy in areas of the front entry or over a tub in the bathroom. These are areas where an elegant or sophisticated design can lend to the privacy desired along with adding beauty and character to a home. Etched glass designs add a great look to recreation areas and bathroom mirrors. Home bar mirrors with your own personal name for your get away create an interesting and elegant look for entertaining or personal enjoyment. Etched glass table tops have enhanced many dining rooms with sandblasted and carved designs. In many commercial environments, the need for name recognition is vitally important. 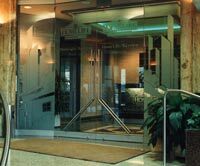 By having your corporate logo/identity sandblasted onto the front entry doors or on a glass curtain wall in a conference room, you are establishing your name with your clients and showing a sense of pride in your company. Also, it is very helpful for clients in locating your office space in larger office buildings . Many clients prefer to have attractive etched glass signs pin mounted above their reception desks which can also be lighted or colored with your corporate colors. These signs can be very versatile in function for the corporate office or small office environment. From company name recognition to adding an element of design, we can provide the correct solution for your needs.